I was very excited while writing this article as the new Call of Duty game has been announced. The first live footage we see is a forest. Well, this is Call of Duty – of course it's a forest. A week before the big Xbox reveal, Infinity Ward is showing off Ghosts to a roomful of journalists in LA. Eric Hirshberg, CEO of Activision Publishing, has been onstage giving it the corporate spiel. 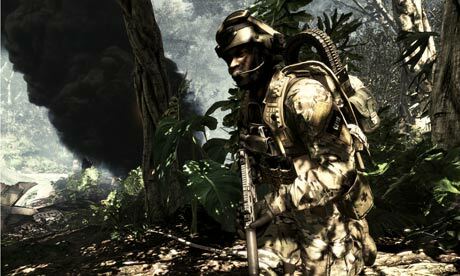 "We could have played it safe and simply made Modern Warfare 4, which is what a lot of people were expecting," he says with admirable understatement. Then he tells us that, before he got on stage, he Googled Modern Warfare 4, just out of interest: "122m search results for a sequel that doesn't exist," he laughs. "That's a lot of built-in interest." Yes, this is the next generation Call of Duty, targeted at the coming Xbox and PlayStation machines. It's built around an entirely new engine, which ramps up every facet of the visual experience. The poly count is through the roof, the textures are super high resolution. The coders have added fluid dynamics, interactive smoke and a new AI system. We're introduced to a cavalcade of improvements. There's a better lean system, which lets you look out over battlefield from cover; the animation is more intuitive and reactive – when your character runs at a wall, he'll just leap over, maintaining momentum. The team has also added a slide mechanic which lets you slip straight out of line of fire, or into an offensive position. It looks like the sliding in Bulletstorm – and indeed, much of this sounds familiar. But here, the screen is alive with detail and activity. "Our goal is to make everything around you more life-like and more immersive," says Infinity Ward exec producer, Mark Rubin when he comes on stage. After a brief behind-the-scenes video from the development studio, we're into a live demo, showing a jungle location. It is a richly organic scene: hundreds of different types of flora surround the player; vines hang from trees; branches part in your wake – you can even make out detail on individual leaves. The air is fecund with mist and insects; we pass a shattered helicopter buried in the undergrowth, and move on toward a water fall, in which a quivering rainbow is suspended. Lead Animator Zach Volker talks about the use of volumetric lighting and self-casting shadows: "specular mapping on particle effects, environmental tessellation and a drastic increase in the sheer volume of objects create a near-photorealistic world," he says. And yeah, it's beautiful, a clear generational leap beyond the current games machines and into the territory of upper-end PCs. The overall message, as you'd expect I guess, is detail: texture detail and geometry detail. We see some of the character models, the eerily life-like faces employing high-res textures, sub-surface skin shaders, multiple lights and self-casting shadows. We see the new weapon models, with every detail modelled down to the texture on the grips and the screws. "All weapons use dual spec metal shaders for enhanced realism," says Volker – I'm not sure how many people in the audience know what that means, but it's the sort of thing you hear at the beginning of a new console generation. He also talks about how the main visual representations of the player character in a first-person shooter are the arms and hands, so the team has bloated the detail here: fine hairs, bruising, cuts, the dirt beneath finger nails …whoa!!! Now thats cool !!! During the brief video at the start of the presentation, Rubin says this: "The story opens with a mass event, America is crippled, the military forces are devastated, the government is in disarray, and as the player you're actually the underdog, fighting back against these superior forces." Immediately I was thinking, so, Modern Warfare 3, then? Mixed with a little Black Ops 2? But the game is definitely taking place in a whole new fictional universe, so this isn't the North Koreans. And it isn't just set in America – there will be missions all over the world. 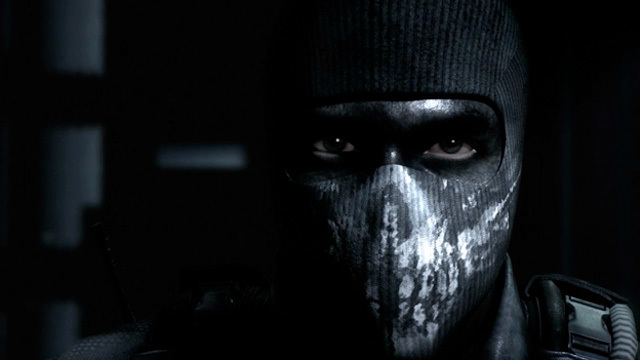 We also know the Ghosts are formed from the remnants of various US special forces outfits. They're an elite fighting force, the Spartans of a post-apocalyptic USA, and they've adopted every technique useful for modern urban guerrilla combat. In this world, they are near-mythical. "The idea of the Ghosts team is that these guys are mysterious," Volker tells me later. "We don't know who they are, we don't know where they came from, we don't know anything about them. But the public sees them as this legendary force that is out doing great things behind enemy lines. They're really a symbol of hope for the American people. Their backs are against the wall, they're fighting for their lives – they see the Ghost team as a possible salvation." The player is a Ghost then? Not quite, not right away. "So when the player and his brother start, you're young, around 18-ish, and this is the world you've grown up in – you don't know any different," continues Volker. "The Ghost team is your idol, it's what you've always wanted to be when you grew up. That's what we wanted to build – the idea that, 'what if the best of the best that we have to offer is a force that you look at from the outside.'" the new engine employs 'Sub D', or subdivision surfaces, a graphical effect which – as the name suggests – subdivides polygons as the camera draws closer to an object, creating almost perfectly curved surfaces. The concept was perfected by Pixar for use in its movies and can be seen working to great effect in the studio's award-winning short Geri's Game. But here, the computationally expensive effect is working in real-time. During his live demo, Rubin shows this off by looking through the sight of his gun; and true enough, the lens seems totally round. "The engine determines on its own how many polygons it needs to create a perfect smooth surface," he says. "And it changes depending on how close you are." The second big term is displacement mapping, another costly effect that's coming in from CGI, a more demanding cousin to bump and normal mapping. This time it's a technique that involves elevating points on a texture surface in order to create a more three dimensional model, which can even cast shadows and occlude models behind it. So instead of a flat texture of, say, a rock face, displacement mapping picks out geometric points in the map and adds geometric data, making authentic outcrops and fissures. In the forest demo, Rubin shows us this effect on the rocks that line a river edge – they're raised and uneven, as though modeled by artists. "But the artists didn't create all these rocks," he says. "This is all done on the fly – the engine is determining what that geometry should look like." It's subtle, but this is lovely stuff for a console game. Back to the demo and we're finally shown another excerpt of in-game footage. This time it's a live mission rather than a scene walkabout. We're with a squad of divers, deep under water, heading out to intercept an enemy ship. The seascape detail is as a rich as the jungle: light beams stream in from far above, coral reefs glow beneath and schools of fish zig-zag past (apparently using crowd AI to bloom away from the soldiers as they pass). Suddenly we're intercepted by some sort of submersible pod, from which enemy divers emerge instigating a brief subaquatic fire fight. Then we're on though the skeleton of a sunken craft and a ruined lighthouse, and suddenly, the ship looms above. The player then launches an RC torpedo, controlling it toward the vessel. There's a huge explosion and after the shockwave, vast chunks of wreckage start dropping through the murky brine. 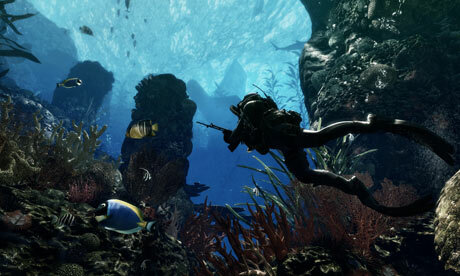 There's a sequence where the player is trapped under rubble, but is freed, only to look up and see dozens of enemy divers heading in. It's time for another shoot out. With guns. Underwater. This is Call of Duty Ghosts. A new world, new engine, new characters, much of it still a mystery. What's clear is that this is no bizarre left-lurching revolution for the series. Hirshberg can rattle on all he likes about taking chances but this is clearly an Infinity Ward CoD title, from the linear design to the emphasis on apocalyptic scenarios and near-futuristic hardware. For now, this is a glimpse at what Triple A next-gen games will look like in the coming months, provided by a developer that is often wrongly overlooked when we think of technical expertise. Some feel that Call of Duty has been fading of late; this is the originator of the brand picking up a megaphone and yelling about the future. Yet, although there are 40 million CoD fans out there listening, it will be interesting to discover how loud this voice really is when other next-gen Xbox titles are around trying to drown it out. Thanks for reading and tell us what you think of this game and please like our Facebook page. Free Download Avast 8 with License Key !! !